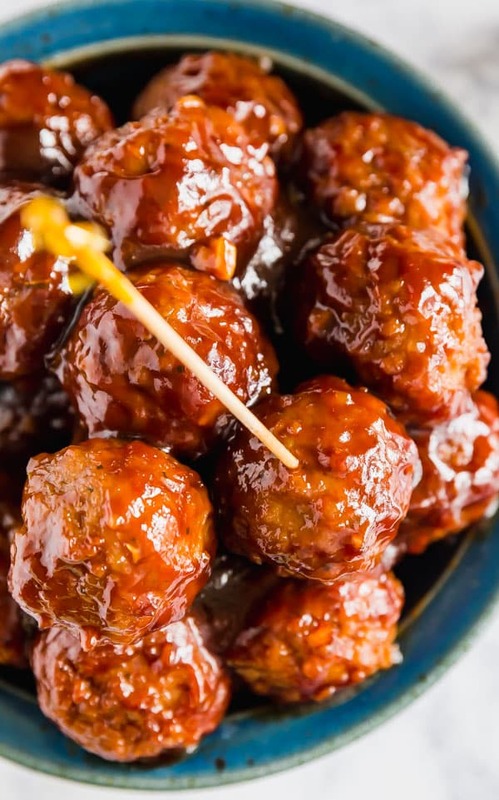 BBQ Crockpot Meatballs: 5 ingredients, minimal effort and maximum flavor! You know what I love on game day? 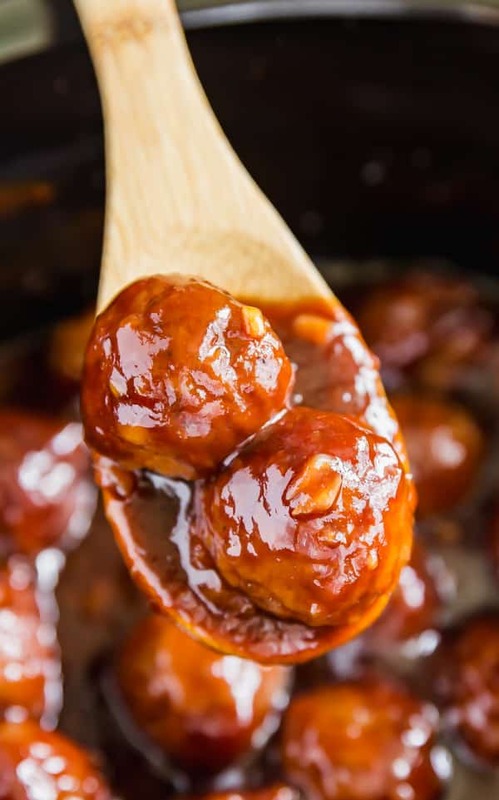 A crockpot full of BBQ Meatballs! In my family we love to make a bunch of delicious appetizers to enjoy while we watch football on Sundays. And as you probably know, I’m not a huge football fan. I’m kind of just there for the food! 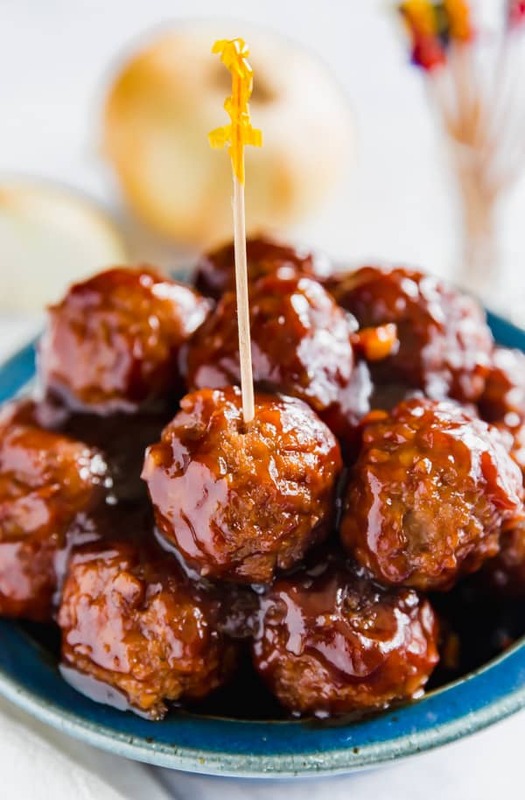 We had a friend who would often bring cocktail meatballs with grape jelly. 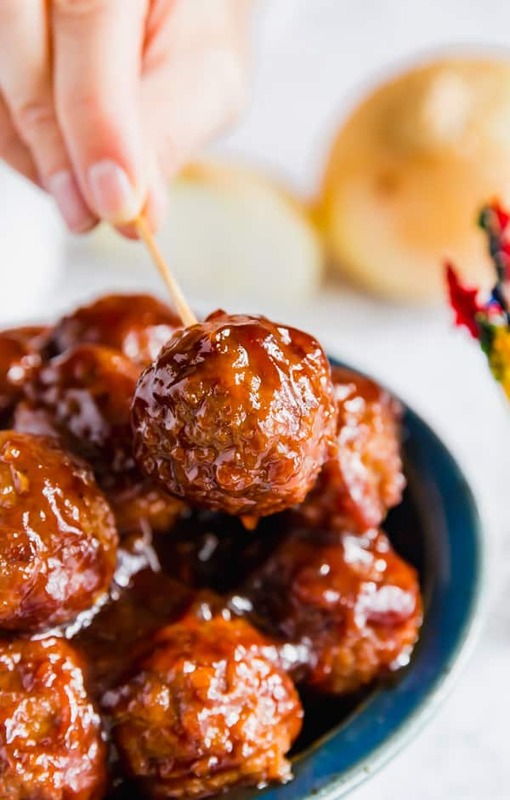 And while they were super tasty, I was just dying to make my own BBQ meatballs recipe that was a little different than those. I knew I wanted a seriously easy recipe that didn’t take up too much time. I also wanted then to be super addictive and the kind of snack you’d happily chow down on along with the rest of your game day spread. I knew I wanted them to be slow cooker meatballs because it allows you to “set it and forget it” and that it’s also super portable. The idea of minimal ingredients appealed to me so you could just a few things into the crockpot with less than 10 minutes prep and then not have to touch it until it’s time to eat. And of course, the last thing I want to be doing on a Sunday morning is rolling ground beef into homemade meatballs; that’s too much work. So this recipe is made with frozen, pre-made meatballs! Look, I love homemade meatballs (check out my Grandma’s real-deal Italian meatballs!). But I promise these will still taste great and be totally easy for you! Mix the sauce right in the pot of the slow cooker! No need to dirty any extra dishes! When you add the meatballs and onions, be sure to stir it well so everything is evenly coated. Don’t worry about stirring the meatballs as they cook. You totally can but you don’t have to. I like to serve them directly from the crockpot and set it to warm after they’re done cooking. Can I make the meatballs from scratch? Totally! My favorite meatball recipe is Grandma’s real-deal Italian meatballs. Can these be made gluten free? Yes, just be sure to choose a brand of prepared meatballs that are gluten free. Do you have to cook meatballs before putting them in a crockpot? No. They will cook in the crockpot. That being said, the ones I purchased were precooked. How long do you cook meatballs in the slow cooker? I went with 2 hours on high heat. If you’d rather do low heat, I’d encourage you to go more like 3.5-4 hours. 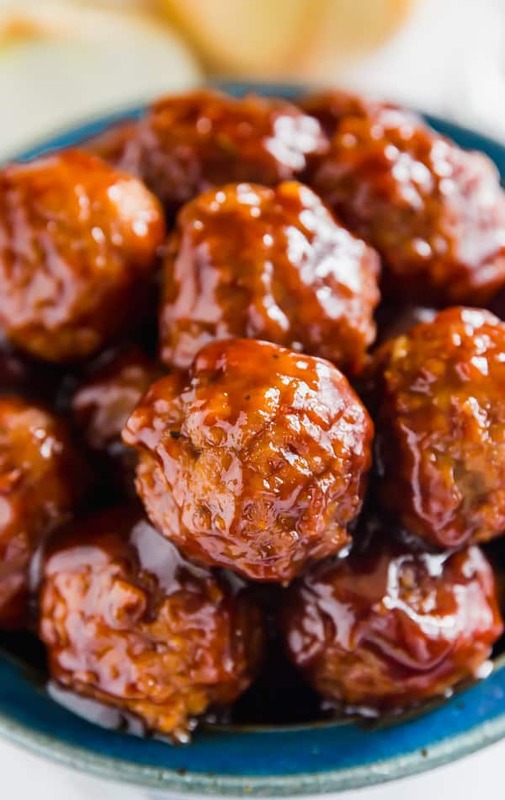 Are BBQ meatballs healthy? Not really. There’s a lot of processed sugar. But these are not meant to be eaten as an entree, they’re designed to be an appetizer, so in theory, you’re only eating a few. In the bowl of the slow cooker, whisk together the ketchup, liquid smoke (or soy sauce) and brown sugar until well combined. Stir in onions and meatballs until evenly coated. Cook for 2 hours until hot and bubbly. Set the slow cooker to warm and serve hot. This recipe was originally post on Easy Good Ideas.